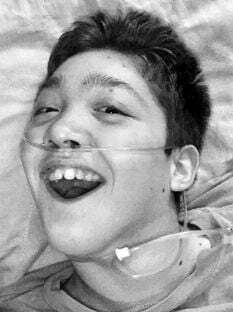 GREENWICH — Matthew (Matty) James Reynolds, miraculously born Aug. 15, 2002, passed peacefully into the hands of the Lord Jesus on April 8, 2019 surrounded by his family at home. We are thankful for being given the privilege of caring for and holding him for 16 precious years. The rustic sign which hung near his bed could not have been more fitting… “Each day is a gift.” Every day we had with Matthew was truly treasured and his life was distinguished by the grace, peace and joy that only God can bring. Matthew was a delight to all who knew him, his smile and loving gaze touching the lives of so many. We know that he is forever in the fullness of the joy he brought to us, now free to physically express the love and worship that was evident throughout his life. He is survived by his parents, Morgan and Tara; brothers, David and Jonathan, and sister Faith; paternal grandparents, Bill and Sue Reynolds of Greenwich; maternal grandparents, Ronald and Ellen Maurer of Marshfield, Wisconsin; and numerous beloved aunts, uncles and cousins, locally and in Wisconsin. We would like to thank the many therapists and service providers that have helped Matty. We know he will be forever grateful to you for your love and care. Calling hours are scheduled from 5 to 7 p.m. Friday, April 12, with a funeral service and reception at 1 p.m. Saturday, April 13, both to be held at New Covenant Community Church in Greenwich. Donations can be made to the Canal Street Arts Center, 88 Broad St., Schuylerville, NY 12871, as well as the Easton Greenwich Rescue Squad, PO Box 84, Greenwich, NY 12834. Arrangements are under the direction of Flynn Bros. Inc. Funeral Home, 13 Gates Ave., Schuylerville.